Located just a 1-minute drive from Bucknell University this Lewisburg motel features suites with full kitchens. Free WiFi access is available. A balcony with views and a seating area with a sofa are included in each guest suite at All Suites Inn Budget Host. The full kitchens are equipped with a hob and oven. 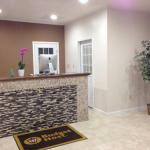 A 24-hour front desk is provided at the Lewisburg All Suites Inn. An array of activities can be enjoyed on site or in the surroundings including cycling fishing and hiking. Lewisburg Area Recreation Park and Turtle Creek Park are both 4 minutesâ?? drive from the motel.